Summer is coming - and with it, a new Microcosm exhibition showcasing CERN (see here). But while the new exhibit is preparing to enchant visitors, many have been asking about the site's former content. Will it simply be out with the old and in with the new? Not as such! 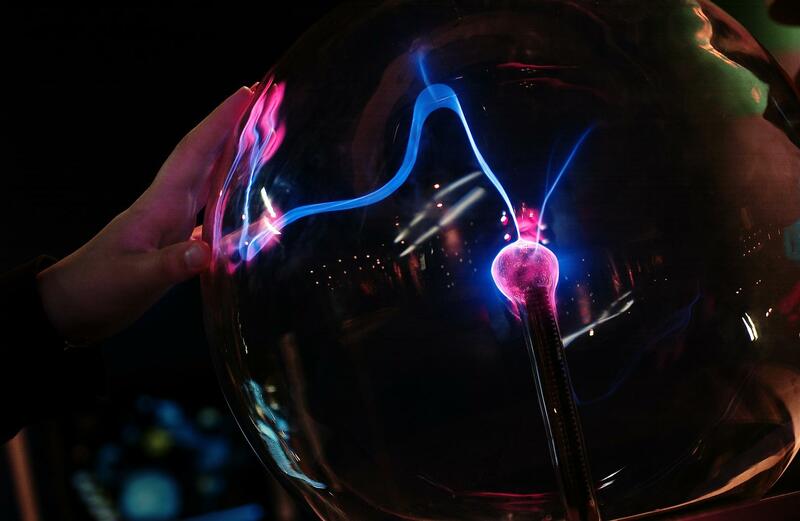 The plasma ball from Microcosm is now on display at the LHCb site. As Microcosm's new content is moving in, its old content is moving up. From LHCb to IdeaSquare, former Microcosm displays and objects are being installed across the CERN site. "Microcosm featured many elements that were well suited to life outside of the exhibition," says Emma Sanders, Microcosm project leader in the EDU group. "We didn't want this popular content to go to waste, and so set out to find them new homes across CERN." The LHCb experiment has received a number of Microcosm favourites, including the Rutherford experiment, the cosmic ray display and the Thomson experiment. "We're planning to develop the LHCb visitor space, rearranging our displays and even creating a small cinema in our former control centre," says Bolek Pietrzyk from LHCb. "Not only will we incorporate the Microcosm displays and exhibits, we'll also be recycling some of its 'hardware'. The Microcosm cinema seats, for example, will become the LHCb cinema seats." Over at S'Cool Lab, items from the Microcosm weak force display have already been put to work. "I am using these slightly radioactive everyday objects with the iPadPix prototype, a pixel detector and iPad combination that visualises radioactivity in real time," says Media Lab's Oliver Keller. "The idea is to use them and the iPadPix in hands-on S’Cool Lab workshops on radioactivity." 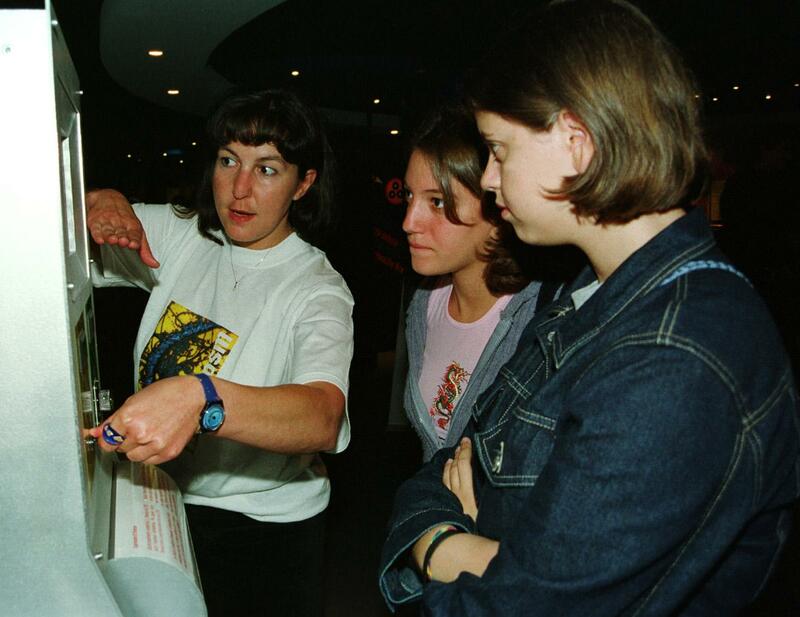 A CERN Guide (left) explains the Thomson experiment (now at the LHCb site) at the launch of Microcosm’s “What are we made of?” exhibition in the year 2000. IdeaSquare will be displaying information panels from Microcosm, which explain the basics of each of the four LHC detectors. "We are planning to install them on the wall of one of our corridors in the newly renovated building 3179," says IdeaSquare's Harri Toivonen. "This building hosts detector development R&D projects as well as a master's-level student programme and related events. The panels will not only provide basic information about the detectors for VIP visitors and student programme participants, they will also serve to remind us why we (IdeaSquare) exist." So to those of you who were worried about the fate of yesteryear's Microcosm, rest assured! Its content has gone on to inspire visitors across CERN.